The Victorians would send a message ‘hidden’ in a bunch of flowers. In the Zulu tradition different coloured glass beads, are woven into patterns, then worn as bracelets and necklaces – which tell a message. 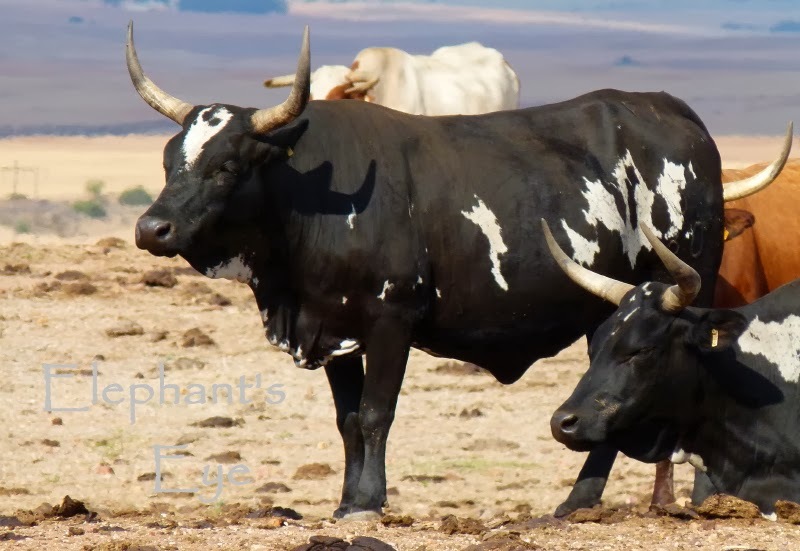 In Zulu traditional custom, when a cow is given, it must carry a particular pattern, which has a significant meaning. It is not just sommer another cow. Adapted to survive in our hot climate, against the ticks and diseases (unlike animals bought from Europe). There are a few herds on surrounding farms. 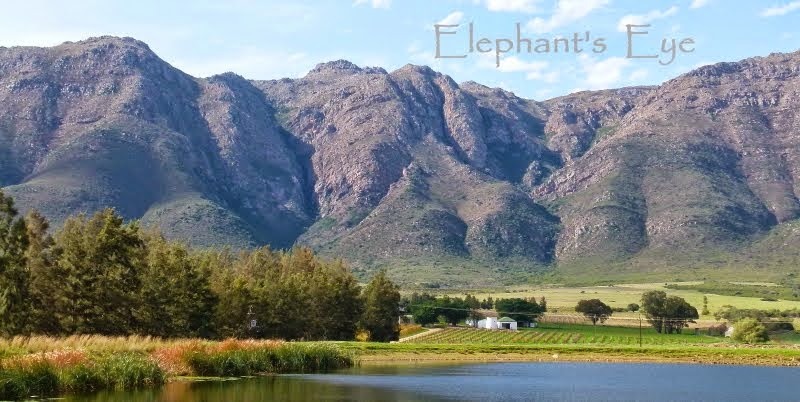 Paardenkloof Wine Estate tells us ‘Nguni eat what they find on the farm, including the reeds, something nobody else is interested in’! 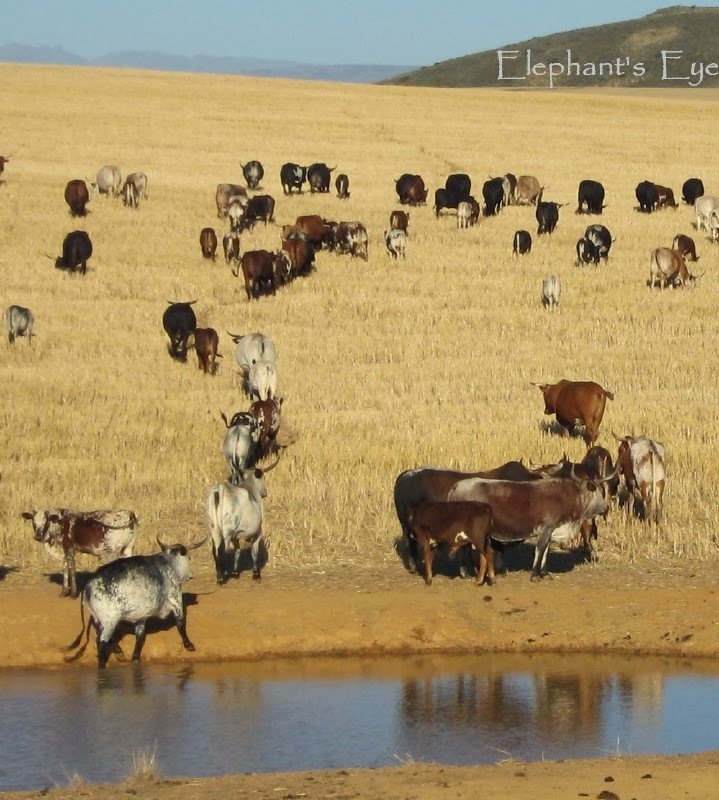 There is a particularly covetable book written by Marguerite Poland (based on her thesis in 1997) and social anthropologist David Hammond-Tooke, called The Abundant Herds, with art work by Leigh Voigt. The Zulu language has a poetic name for each pattern. Combining full use of his new zoom lens, with him standing right AT the barbed wire made the calves stand up and say – Mum, what’s that man doing, why is he clicking at me? When he moved along the fence to take another group – Mum got up too and glared at him – You leave my baby alone! In the UK Telegraph January 2009 scientists say - Cows with names produce more milk. 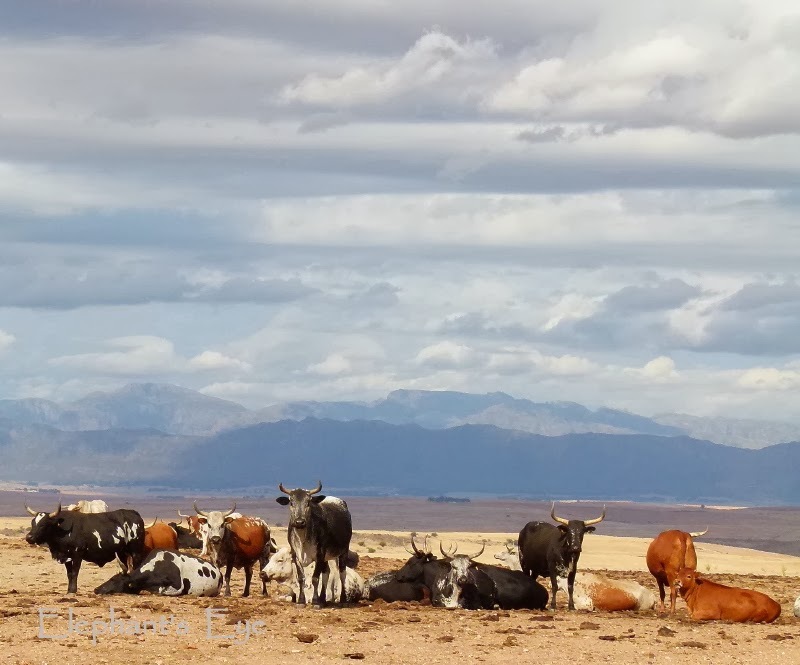 If you ARE going to name your cows, how much easier if they are Nguni. Instead of five brown cows, you have something more like a class of school children. Each one unique, not just in its personality but also, kindly in the colours and designs in the hide on her back. 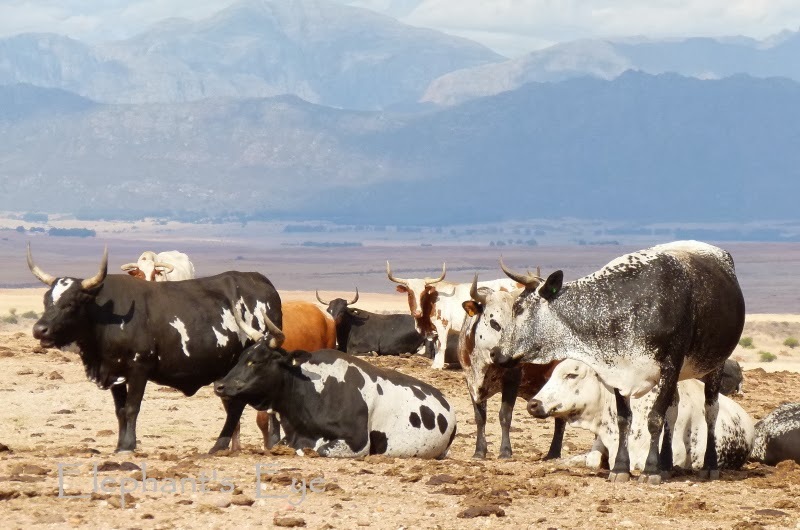 Dianne Hofmeyr Abundant-words names her five Nguni rugs. Do you know Dylan Thomas? His ‘Play for Voices’ Under Milk Wood - first published in 1954, and has never been out of print. Farmer Watkins in Salt Lake Farm hates his cattle on the hill as he ho’s them in to milking. he bawls to the cow who barbed him with her tongue, and she moos gentle words as he raves and dances among his summerbreathed slaves walking delicately to the farm. The coming of the end of the Spring day is already reflected in the lakes of their great eyes. Bessie Bighead greets them by the names she gave them when they were maidens. Taken with his old camera, as we stopped on a November evening in 2009. How can you read his words, without your heart delighting in the joy and lilting music of his Anglo-Welsh? Not especially moved by Dylan Thomas - but the cattle are BEAUTIFUL, beautiful, beautiful. 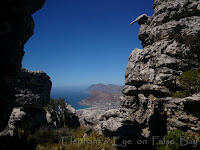 Movingly beautiful. . . . and I'm wondering why I'm here instead of at False Bay. Now I'll have to go and see what's happening there. 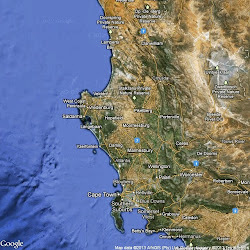 still waiting for the one to buy our house, then you will find me only on the False Bay blog. the new blog will come to life, when I can do Wildflower Wednesday with Look, look what I found in our new garden ... one day! What a fascinating breed. And each animal is beautiful in a unique way. I got a kick out of reading the nicknames for their various markings. Cows are big business and a cultural trademark here in my part of the U.S. Wisconsin is considered the "Dairy State." Most of our cows are black-and-white Holsteins, but some farmers have other breeds, too. This is a beautiful and fascinating post. Beautiful pictures !!!! your cows look so different from ours ! I love 'Under Milk Wood', Diana, and enjoyed reading your relevant snippet. Dylan Thomas seems to be a little out of fashion here in the uk, which is a terrible shame. I love the Zulu names, which are so evocative, especially 'The hornbill takes to flight'. My goodness those are beautiful animals. They contain a type of grace very rarely seen in Bovine's. Beautiful animals, and colourful too.... have a nice weekend. 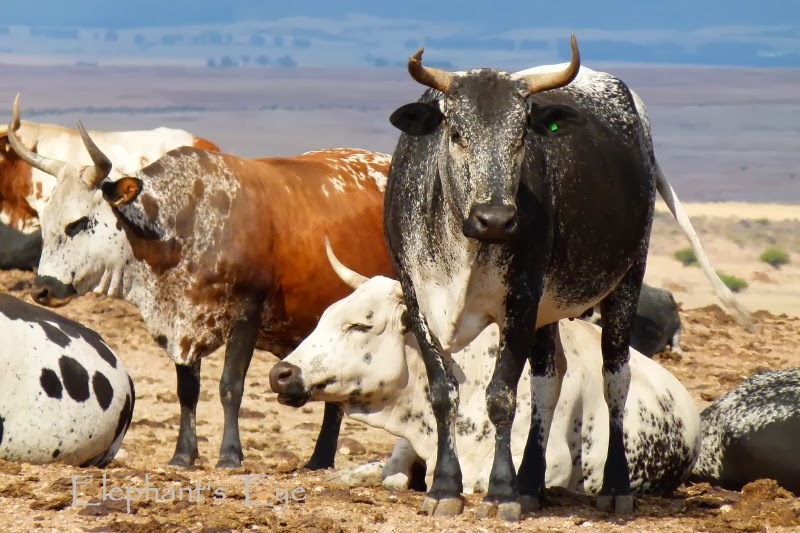 Fascinating colors and names for the patterns...love the glaring cow. I had no idea about this lovely creature. I've never seen such beautiful cows, good to highlight the importance of native breeds of animals as well as native plants. 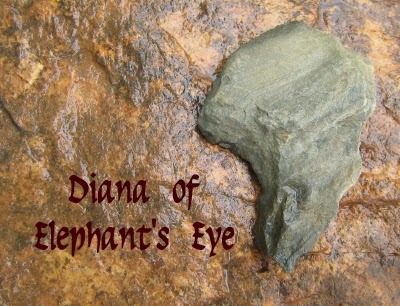 Diana, I very much enjoyed this post! 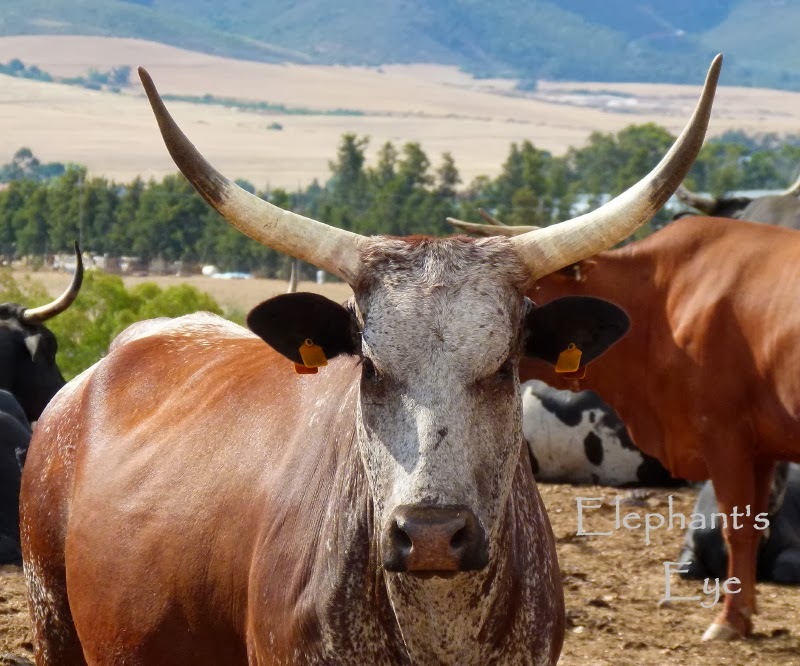 I agree that these must be the most beautiful cows on earth, and so full of expression. 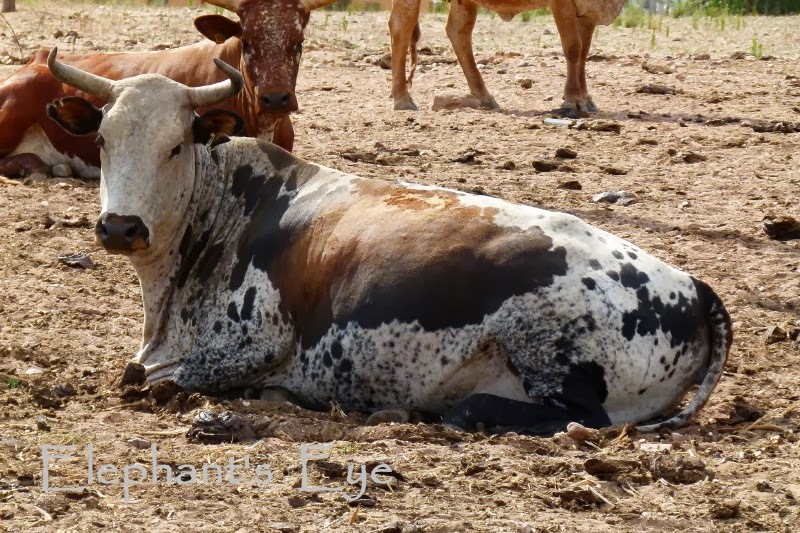 I love the photo of mama cow glaring into the camera! I also appreciate how descriptive the Zulu language is. I suspect that the Zulu language must be just as rich in all its descriptions. 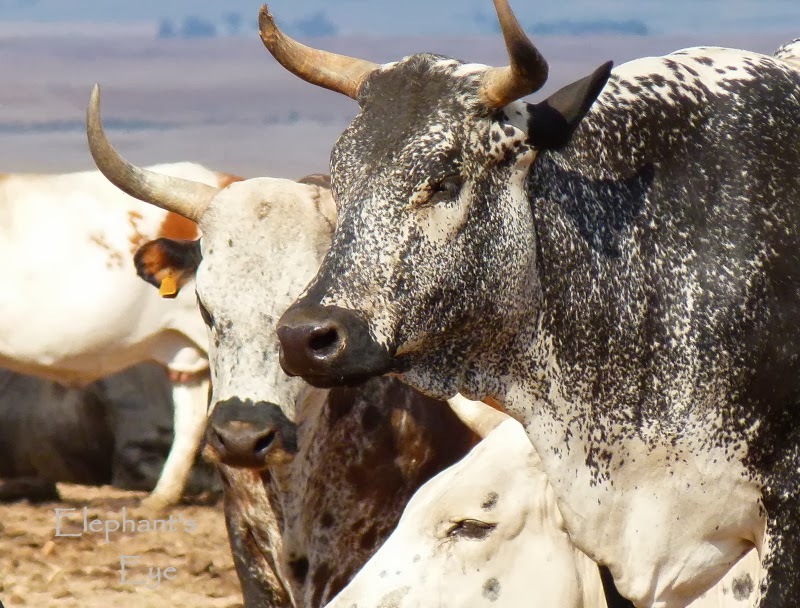 No wonder photos of Nguni are your most popular downloads, they are utterly beautiful. 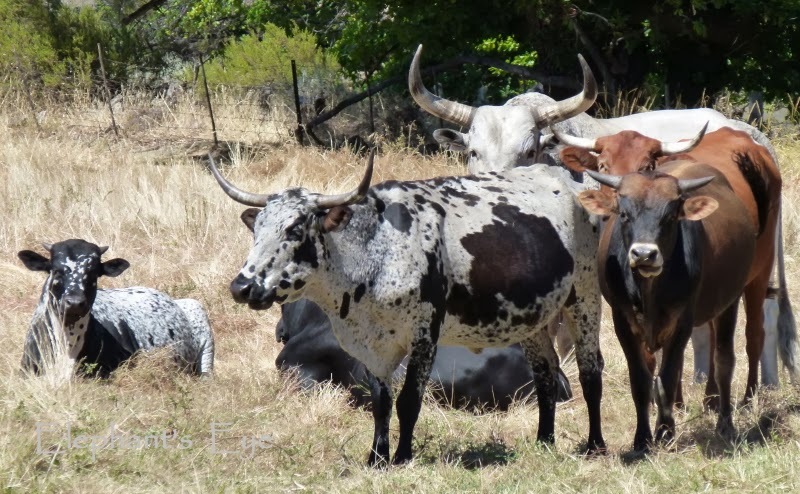 I love that there are names for the patterns on the hides, and that gifts of Nguni are carefully chosen for the meaning of those patterns. Rather beats the tat we so often send one another as gifts in the affluent west. that surprises me! 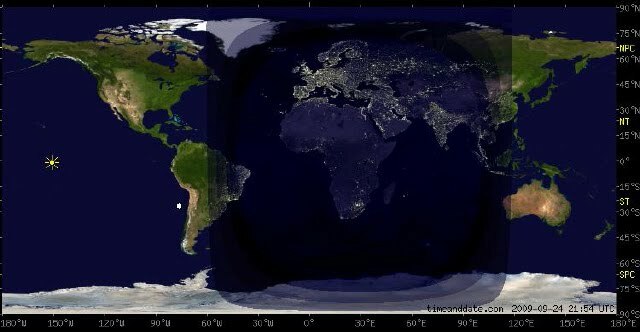 In a Malaysian geography class?